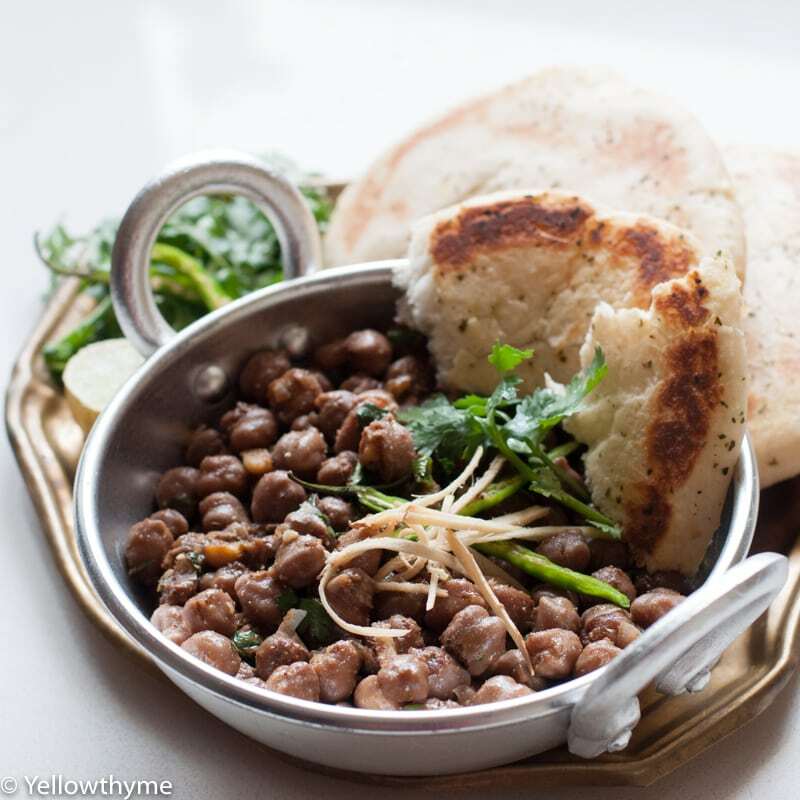 This Authentic Pindi Channa recipe is a spicy chickpea dish made with White Chickpeas boiled with tea and roasted Indian spices.This chickpea dish is usually eaten with Kulchas, bhatooras and often with samosas as a snack. Authentic Pindi Channa has a characteristic color- it’s usually dark brown in color and that’s because it’s boiled with tea.The other very distinct aspect of this dish is the use of anardana or dried pomegranate seeds. These two things make pindi chana different from all other kinds of channa preparations. Despite this, every house has their version of Pindi Channa and this is ours.You could use a store-bought spice blend and reduce your work by 75 % but then grinding fresh spices gives a fuller, fresher flavour which storebought masalas cannot give. This recipe is the best example of how healthy indian cuisine is.Chickpeas is something that’s taken the world by a storm..every health guru swears by it but chickpeas aka chole is something we Indians eat almost every week! This recipe is – Vegan hence vegetarian, low carb and high in protein. Our only mistake is probably pairing it with high carb breads like kulchas,bhatooras and pooris. Instead, when eaten with healthier chilla- besan dosa or millets this can become a great healthy meal.This meal will not only be filling but it will make us emotionally full as well because chole is a very emotional food for us Indians. You should also check out my other healthy snacks and salads made with chole – Power Packed Chickpeas Tahini Salad , Healthy Falafel and Easy Beetroot Falafel. So my take is that you shouldn’t let this amazing dish be limited to only festive occasions as it is action packed with nutrients! Dried chickpeas can be quite a challenge for people who dont know the tricks! First- always soak the chickpeas overnight before boiling them the next day.This will make the actual boiling process easier. but here is the TIP of the DAY- if you have forgotten to soak them the night before, soak them for 1 hour in hot water for the same effect! Cook them in pressure cooker with 3 times the water plus some salt for 20 minutes. This is my new favourite set it and forget about it method! Pressure cook the chickpeas with 3 times the water for 20 minutes on HIGH with the release in SEALED position.Let the pressure release naturally.Thats it! In fact you can soak the chickpeas overnight in the instant pot, set the timer for pressure cooking in the morning and you get freshly cooked chickpeas early in the morning before you get up. There are two reasons why I love making the masala for the pindi channa from scratch. One obviously is that freshly ground spices give better flavour and aroma than the store bought spices. Second, You can control the spice level. Tweek around and reduce the chilli or increase the cinnamon.It gives you a better control over your dish. Especially when you have children around- reduce the amount of dried chillies and pepper.Skip the green chillies all together. but if for some reason you don’t want to make this masala, by all means buy the store-bought one.It will definitely reduce the work to 1/4.I suggest MDH or Everest Channa Masalas. Authentic Pindi Channa - Step by Step Video recipe of Chickpeas or Channa boiled with tea bags and cooked in a spicy homemade indian Spice Masala. Roast for 5-10 minutes on low-medium heat.Transfer to blender and a Add rest of the ingredients listed under"dry Masala"- anar dana, dry Mango Powder and Salt. Soak the Chickpeas overnight and pressure cook it along with 1 tsp Salt and the tea bags for 20 minutes.Let the pressure release naturally.Drain and save some boiling liquid. Heat the Ghee in a pan.Add Asafoetida,Green Chilli and Ginger.Saute for 30 seconds.Add the Drained Chickpeas.Add the Dry Masala. Mix it well.If it gets too dry, add the boiling liquid. Roast for 5-10 minutes .Transfer to blender and a Add rest of the ingredients listed under"dry Masala"- anar dana, dry Mango Powder and Salt. Soak the Chickpeas overnight.Set the Instant pot to "Pressure Cook" .Add the Chickpeas it along with 1 tsp Salt, 4 Cups Water and the tea bags.Set the instant pot to Pressure Cook for 20 minutes.Let the pressure release naturally.Drain and save some boiling liquid.